One of the challenges about trying to buy more things made in America is that at first glance, there doesn't seem to be a whole lot of options out there. One can only take so much gold lamé 80's inspired stripper wear in life, American Apparel. Another challenge about my new shopping/ brand partnership guidelines is trying to figure out how to do promotions that fit into this somewhat narrow area now. One of the reasons why I was tempted to just scrap my entire blog is the fact that 1.) I quite obviously enjoy shopping and I'm not ashamed of that fact (alone), and 2.) it's inherent in style blogging for the author to say "Buy this!". So I get that this dichotomy is going to be quite perplexing for us all. In one breath I'm saying "Buy less!" but in the very next breath I'm saying "But buy this!". So please know this: when I do brand or company spotlights or promotions or giveaways I hope that you shop responsibly. I want to shop responsibly! Maybe shopping is like drinking. I recommend having a beer or two every now and then and will also recommend that you get a nice beer (back away from the Miller High Life! ), but I do not recommend going on a bender with either cheap beer -OR- nice beer. Or maybe shopping is more like eating fried chicken. It's okay to have it every once in a while, but... never mind. I'm not the greatest with analogies. You get what I'm saying, right? Look! Dresses with pockets. I know you're a sucker for dresses with pockets! Just a heads up, though: the photos of Many Belles Down on High Gloss Fashion do not do the clothes complete justice. 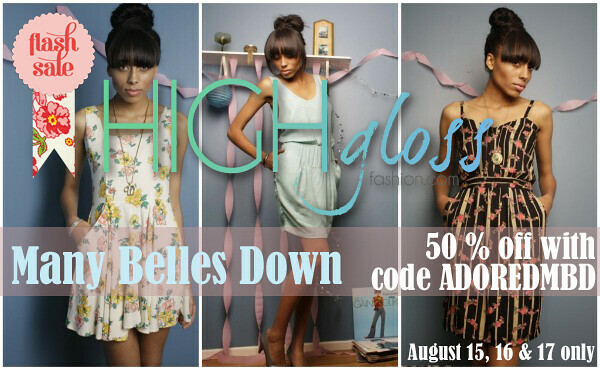 I recommend checking out Many Belles Down on their official site to get a better look at them. I believe my MBD dresses will arrive today, so as soon as they get here, I'll snap a few photos so you can love them and then immediately decide to be dress twinsies with me. In the meantime, explore this great, new brand! But yeah, don't get drunk or eat too much fried chicken or... whatever. You know what I'm saying.